Collins Booksellers - Mechanics of Fluids by John Ward-Smith, 9781351988520. Buy this book online. 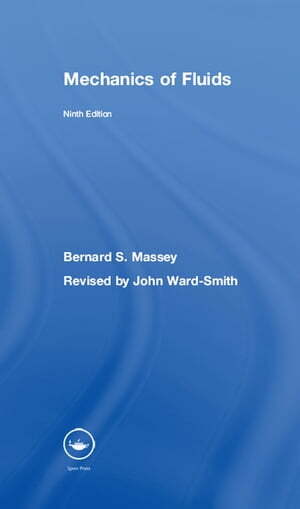 As in previous editions, this ninth edition of Massey’s Mechanics of Fluids introduces the basic principles of fluid mechanics in a detailed and clear manner. This bestselling textbook provides the sound physical understanding of fluid flow that is essential for an honours degree course in civil or mechanical engineering as well as courses in aeronautical and chemical engineering. Focusing on the engineering applications of fluid flow, rather than mathematical techniques, students are gradually introduced to the subject, with the text moving from the simple to the complex, and from the familiar to the unfamiliar. In an all-new chapter, the ninth edition closely examines the modern context of fluid mechanics, where climate change, new forms of energy generation, and fresh water conservation are pressing issues. SI units are used throughout and there are many worked examples. Though the book is essentially self-contained, where appropriate, references are given to more detailed or advanced accounts of particular topics providing a strong basis for further study. For lecturers, an accompanying solutions manual is available.